Gesualdo’s Responsories for Holy Week need no introduction by now; not so La Compagnia del Madrigale, a recently formed ensemble, several of whose members have been long-standing alumni of Concerto Italiano and (latterly) La Venexiana. Like these groups they are a mixed ensemble singing one-to-a-part, and this new release is a clear statement of intent. It’s only the third complete recording of the set, as far as I’m aware, coming hot on the heels of Philippe Herreweghe’s fine account, released late last year (the other being The Hilliard Ensemble’s, made more than 20 years ago). The monumentality that I identified in both earlier sets seems consciously to have been avoided: indeed, the booklet-notes stake La Compagnia’s claim to interpreting Gesualdo’s sacred music in the light of his madrigals. 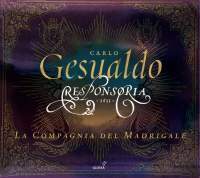 The intriguing decision to place the Responsories in context by interspersing them with spiritual madrigals by Gesualdo and his contemporaries may be taken in the same sense. Still, I struggle to discern a madrigalian colouring beyond what can be attributed to the ensemble’s constitution. In contrapuntal passages in which each voice must hold its own line with a clear sense of purpose, the cast seems uneven. Long passages of the Good Friday set are insufficiently characterised: when, at the end of Friday’s final Respond, Christ asks whether any pain is equal to his, there’s little anguish. In the most overtly dramatic of the three days, Holy Saturday, it is as though the avoidance of monumentality is achieved at the expense of rhetorical bite (a point illustrated by the opening Respond, ‘Sicut ovis’, or the outburst proclaiming ‘the day of the Lord, most great and bitter’ in ‘Plange quasi virgo’: why don’t those dissonances hurt, and why is the pulse not convulsed at such points?). Especially given the claims made for it, one expected a far more searching account and a stronger sense of direction from singers of this pedigree. Others may well respond more positively to this toned-down approach and yet feel that it could have been more convincingly executed.